I'm atop a ridge line in the free riding area in Gunnison Gorge National Conservation Area, near the Peach Valley parking area. The track you see is a double track, meaning ATVs can use this trail too. The area is called "the adobes" because of the adobe soil: crumbly and with relatively good traction. Note that the trails tend to follow the ridge lines. If you want to look at the stunning views, stop! When you're moving, you need to concentrate on the trail. After all, it's a long ways down on either side! Yesterday I drove to the Peach Valley parking area in the Gunnison Gorge National Conservation Area near Olathe, Colorado. Directions: From Hwy 50, just south of the traffic light, turn east on Falcon Road and follow it until it becomes dirt. Keep going, cross the bridge, and the parking area will be on your right. There’s a large “free riding” area and I made use of it freely—so freely I got lost. Thank goodness for the GPS! I was able to retrace my steps and get back to the parking lot. (GPS track is below.) The lesson here? The place is such a spider’s web of tracks that you can find yourself, as I did, with no way out except to climb steep hills. I got much better yesterday at climbing steep hills. See the photo below for some of the steep hills, keeping in mind that the tracks (mostly single tracks) follow the ridge lines. 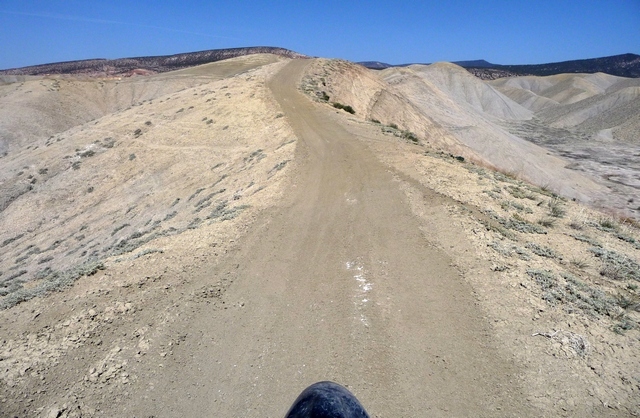 Hills in Peach Valley free riding area of Gunnison Gorge NCA. Note that the trails tend to follow the ridge lines. I’ve upgraded some equipment. I acquired Jayson’s old 3-rail motorcycle trailer and made a couple modifications to make loading and unloading the bike easier. This allowed me to run several errands prior to riding, and then go to a Montrose Amateur Radio Club meeting afterwards. It worked out well. 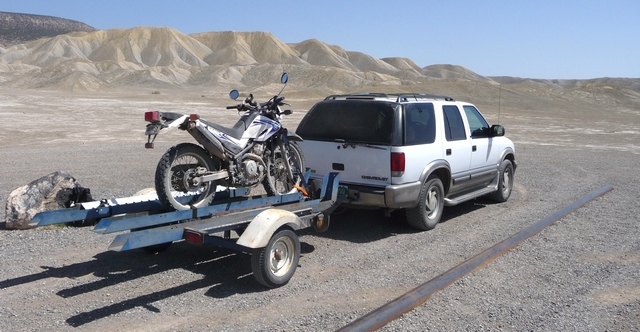 Three-track motorcycle trailer can carry up to three bikes at a time. The parking area is improved, with both an area for trailers and another area where you can back up your truck and drive your bike right off without needing a ramp. The free riding area encompasses several thousand acres both south of and north of the parking area. There are far more trails than have ever been mapped. Presumably some of them are named trails, but the naming signs are few and far between and key forks remain unmarked. I did some exploration and found a road (jeep or pickup truck) barred at either end by ranch gates. * I then went back and followed a trail to the east that goes right along the ridge and offers stunning views. It ends at a fence. So I went back. BTW, the little excursion that I thought wasn’t taking me to the parking area probably would’ve put me out on Chukkar Road, which would have led back to the parking area easily. Moral of the story? Keep track of where you are. Don’t go down any hills that you wouldn’t want to go back up. Oh…and take a GPS that collects a track so you can follow it back to base camp! 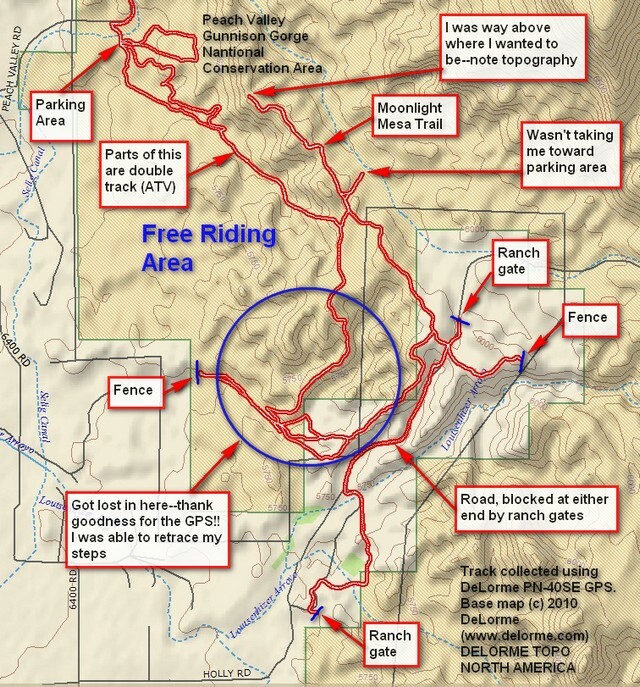 This entry was posted in GPS Tracks, Montrose County, Motorcycling and tagged Colorado, dirt bikes, Gunnison Gorge National Conservation Area, montrose county, motorcycling, Olathe Colorado, Peach Valley. Bookmark the permalink.